GW’s first product was “Sativex”, a mouth spray intended to alleviate symptoms of multiple sclerosis, licenced as a prescription-only medicine in the UK in 2010. When launched, Sativex became the world’s first prescription medicine derived from the Cannabis plant. The botanical drug is a unique extract of the plant, containing a combination of cannabidiol (CBD) at 2.5mg and the psychoactive component tetrahydrocannabinol (THC) at 2.7mg. Sativex aims to treat spasticity, neuropathic pain, overactive bladder and other features associated with multiple sclerosis. The spray’s principle compounds represent just two of at least 113 known cannabinoids: marijuana-derived chemical ligands that act on specific receptors in brain cells to trigger neurotransmitter release and the resulting downstream effects on the human body. CBD and THC are types of ‘phytocannabinoids’ which are found within the Cannabis plant; others include ‘endocannabinoids’ which are ligands found naturally within animals, or synthetic cannabinoids that are produced artificially in industry. Since its 2010 UK licencing, Sativex has received formal approvals for MS spasticity in a host of European countries including Spain, Czech Republic, Germany, Denmark and Sweden. In 2011, GW licenced to the Swiss pharmaceutical giant Novartis the rights to commercialize Sativex in parts of Asia, Africa and the Middle East. In Canada, Sativex has also received approval for neuropathic pain in multiple sclerosis as well as cancer pain. In the ever-important US market, GW has signed an agreement with Otsuka Pharma to develop and market the drug over there. Since its launch, the spray has been sold in almost 30 countries and its demand has seen GW produce 100 tons of medicinal cannabis since 2012. Despite its widespread exportation from the UK, Sativex has faced a mixed reception. As being one of the first out of the blocks in the medical marijuana market, early scepticism from investors was an issue, in part due to the ongoing socio-political debate about cannabis legalisation in the States and Europe. Those with knowledge of the industry say that Sativex is nothing new. Critics believe that the marijuana plants are grown under the same conditions as most sophisticated illegal cannabis farms, with the same clonal propagation methods, lighting, ventilation and hydroponic techniques. GW are thought to dissolve Cannabis leaves in ethanol to make a tincture and add peppermint oil to improve the taste, before packaging the finished product into aerosol containers for market. It is also unlikely that the product contains only CBD and THC. Many believe several, perhaps over 100, cannabinoids are present along with flavonoids and other compounds one would find in a typical Cannabis plant. If that is the case, then GW have simply repackaged existing technology into a government-friendly bottle. Indeed, the greatest fear of GW will be a widespread legalisation of cannabis that could see more and more patients grow their own hemp or obtain marijuana from other, cheaper sources. At some point it is expected that comprehensive recreational reform will sweep from the Dutch border across Europe and that federal laws in the States will ease even further. In turn that will lead to a new bustling global marijuana market and more competition for GW to face. These are concerns for the future, however. Sativex’s greatest issue at the moment is its ineffectiveness in clinical trials. Of the two preliminary stage III studies investigating the treatment of MS sufferers, only one has shown a statistically significant reduction in spasticity (1.2 points on the 0-10 point scale versus 0.6 points under placebo). Indeed, a systematic review in 2014 by the American Academy of Neurology resulted in the rather vague outcome that Sativex was 'probably effective' for spasticity, pain, and urinary dysfunction, but wasn't beneficial for tremor. Combine this with a high price that is putting off UK Health authorities, and you have an even bigger problem. The drug has also been tested in trials for cancer pain, although in Phase III trials it failed to reach its primary endpoint. However, Phase II studies with Sativex in combination with chemotherapy drug temozolomide have shown impressive results for treating cancerous brain tumours. GW have stated that the research and development of Sativex will continue. Luckily, GW’s latest venture is looking more like the blockbuster drug they hoped for. Having been approved in June 2018 by the notoriously difficult US Food and Drugs Administration (FDA), their oral treatment of purified cannabidiol (CBD) for severe childhood epilepsy - trade name “Epidiolex” - was launched as a prescription medicine in the US in November 2018, for seizures associated with two rare and drug-resistant forms of epilepsy (Dravet and Lennox-Gastaut syndromes). The drug can currently be prescribed for children over the ages of 2 years old and the early signs look promising: the most recent FDA-approved physician-reported data showed that 47% of 261 patients experienced a ≥50% reduction in seizures after 12 weeks treatment. The company has also applied to launch the drug in Europe, with a decision expected in early 2019. Justin Gover, the CEO of GW Pharmaceuticals, believes that the approval of their ‘lead’ drug recognises the field of medicinal cannabis as a “serious science”. Epilepsy has seen few major pharmaceuticals develop new therapies in recent years and GW will therefore plan to establish themselves as leaders in the market. The company hopes that the early success of Epidiolex will open the door for the drug to be licenced for additional orphan seizure disorders in the future. Interestingly, the precise mechanism of action by which Epidiolex produces its anticonvulsant effects in epilepsy are not yet understood, but is thought that CBD has a cumulative antiepileptic effect, modulating various endogenous systems. Ongoing research in the coming years may shed more light on the exact pathways involved. As well as Sativex and Epidiolex, GW state that they have a ‘deep pipeline’ of further medicinal cannabis products undergoing clinical trials. The company is particularly keen on continuing their program of identifying neurological diseases with unmet remedies, as they believe that this approach maximises the potential benefits to patients and provides the greatest returns to shareholders. In order to maintain their status amongst the world leaders of medicinal cannabis, GW have assembled an extensive worldwide network of scientists in cannabis research. The diseases they treat may be rare, and their products yet to fully take off, but there is quite simply no other company yet in the world to have achieved such success in the medical marijuana market. 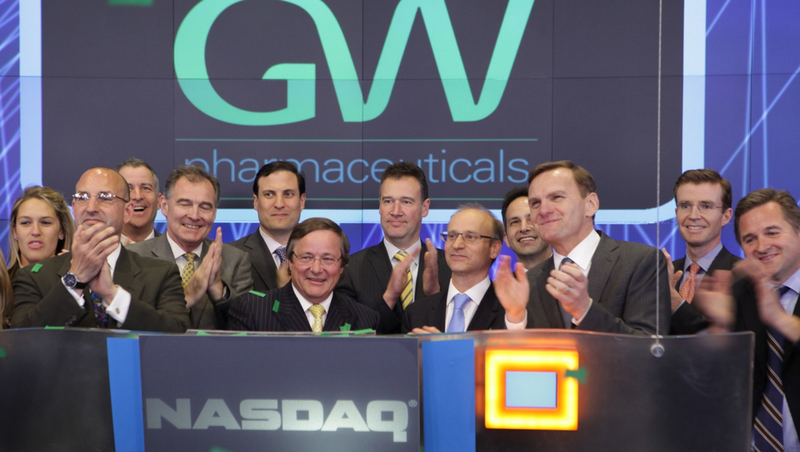 GW Pharmaceuticals will hope that the best is still to come. Marijuana’s medicinal properties have been known for thousands of years. Hemp is first thought to have been cultivated in China for the production of textile fibres but the plant has its roots firmly in American history too. In fact, George Washington, the first President of the United States, grew Cannabis at his estate at Mount Vernon, North Virginia. However, in the early 20th Century, as part of the US Government’s crackdown on recreational narcotics and their trade, marijuana became somewhat of a scapegoat as it was labelled as “the killer weed” for its links to crime. By the time of the 1970 Controlled Substances Act, decades of research into the plant’s medicinal properties were put on hold as cannabis was federally outlawed for all types of use. By assigning the drug as a Schedule I classification, with a “high potential for abuse”, the drug was deemed by the US Government to have no accepted medical use, a statement that today is rifely debated by growers. Those in the industry say that marijuana’s potential as a medical drug is vast: reducing eye pressure (glaucoma), alleviating the side effects of cancer treatment, acting as a bronchodilator, relieving stress, uses as an anti inflammatory - the list of researched treatments goes on. Opponents of federal legalization of the drug argue that although amnesia may be a relatively harmless symptom, strains with high levels of THC are linked to mental issues including anxiety and schizophrenia in genetically predisposed people, whilst marijuana’s effects on the developing child’s brain are not yet fully known. The long-time criminalization of the ‘gateway drug’ has driven an expansive underground market, and the debate over widespread legalisation of the drug for recreational purposes is ongoing. Those who argue for legalisation point to the flaws in criminalising the drug: federal laws have helped the black market expand and research in the illegal industry has overtaken that of those in government-funded labs. The turnaround began in 2012 when states began to legalise the drug for recreational purposes, starting with Washington, and by 2016, most states had legalised cannabis for medical use. The legalisation of cannabis for recreational purposes has led to the so-called “Green Rush” in the States, and a multi-million dollar industry has grown. Marijuana is largely regulated in a manner similar to alcohol, adopting similar penalties to drink-driving for example. In states such as California and Colorado, adults aged 21 and over can grow up to six Cannabis plants and legally possess up to one ounce of marijuana whilst travelling. Dispensaries and commercial production facilities have also been licenced across states where cannabis has been legalised. As one of the first states to legalise recreational use, Colorado is leading the pack for treating children with epileptic seizures. Mindful, one of the largest cannabis companies in the world, grow more than 20,000 cannabis plants of various strains with a huge and diverse seed bank, giving them a rich intellectual property. After cultivation, they transport their marijuana to dispensaries across Colorado where they are sold in a variety of product forms. Parents, at risk of arrest for trafficking narcotics or child abuse if medicating children in their own states, have flocked to Colorado to treat children with severe epileptic seizures. The life-changing reports that have come out of such stories have only fueled the cannabis fire to federally legalise the drug. Advocates of cannabis legalisation believe that legalisation will better help industries compete with the underground market. Indeed, California legislature was recently passed to give legal cannabis businesses tax breaks - state excise taxes will be cut by 4% for legal retailers and cultivation taxes will be suspended altogether. The industry hopes that these changes will even the playing the field between the green and black market, although opponents believe that it may lead to an uncontrolled industry in which marijuana will be marketed irresponsibly to regular users, similar to how alcohol and tobacco built their financial empires. In terms of medical research, institutions want more. Even with a recently-passed Farm Bill allowing production of low potency marijuana production on US soil, researching strains with high levels of psychoactive THC is restricted, meaning that strains of street cannabis are more advanced than what is actively being researched in labs. That presents a problem for scientists trying to gauge the effects of marijuana on a population, if laboratory environments differ from the reality at play. Nevertheless, it is clear that step-by-step, changes in US law are transforming the marijuana market. For those actively involved in the industry and those invested in it, the future is looking bright.